Thanksgiving—or Friendsgiving—is all about getting loved ones together to enjoy belt-busting, nap-inducing, fuel-your-soul food. Sometimes you’re a guest, sometimes you’re a host; either way, it’s important to make an impression while still feeling comfortable. Our stylist, Jeanne, has selected a couple of sharp outfit options for those who want to look buttoned-up (before loosening a few buttons) at dinner. 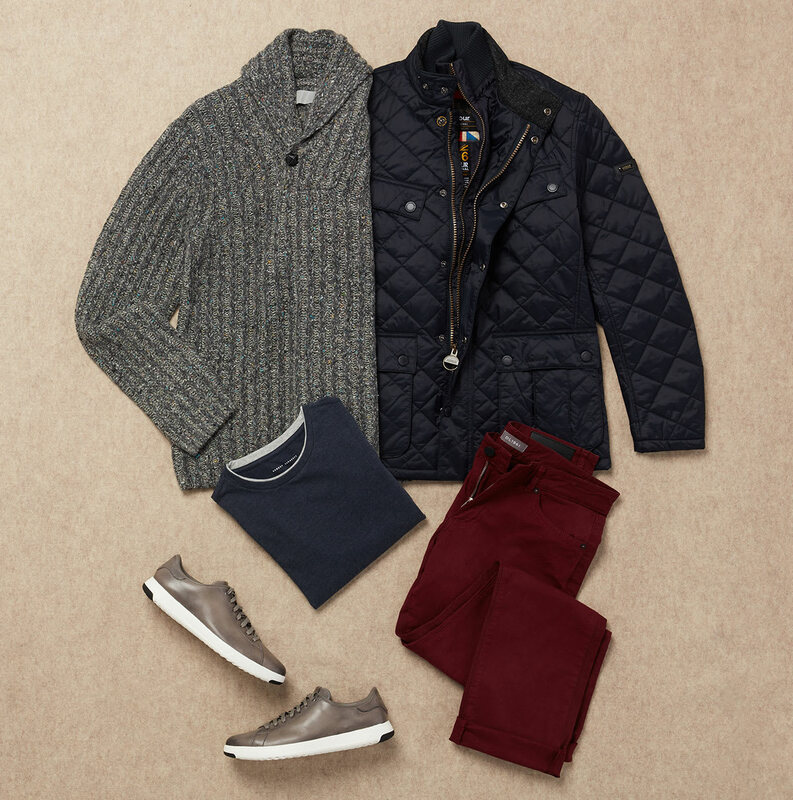 If your Thanksgiving gatherings tend to be casual and chill, an outfit like this one is the way to go. Jeanne recommends a slim-straight pant if you’ll be running around the yard, or if an extra slice of pie is likely in the cards. “Twill pants are dressier than jeans, but have a little stretch to keep you comfortable all day long,” she says. And layer up, too! Starting with a basic solid tee, you have the option to layer on a sweater or cardigan. A quilted windproof jacket ensures you’ll be ready for all of the day’s activities, indoors or out. Whereas the above outfit is fairly relaxed, this one is best for a Thanksgiving dinner that’s a bit more formal. Perhaps you’re going out for the evening, or have in-laws to impress. 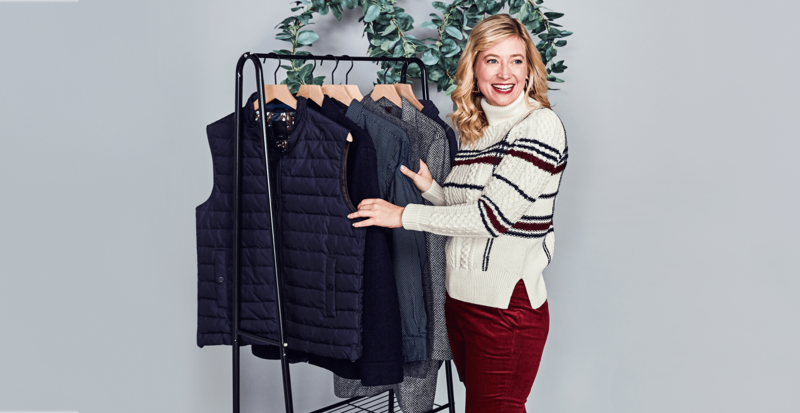 “Wool flannel trousers are warm and soft, and a classic shirt-and-sweater combo in a holiday color pairs perfectly with them,” Jeanne says. Keep in mind that your outerwear is also part of the outfit. 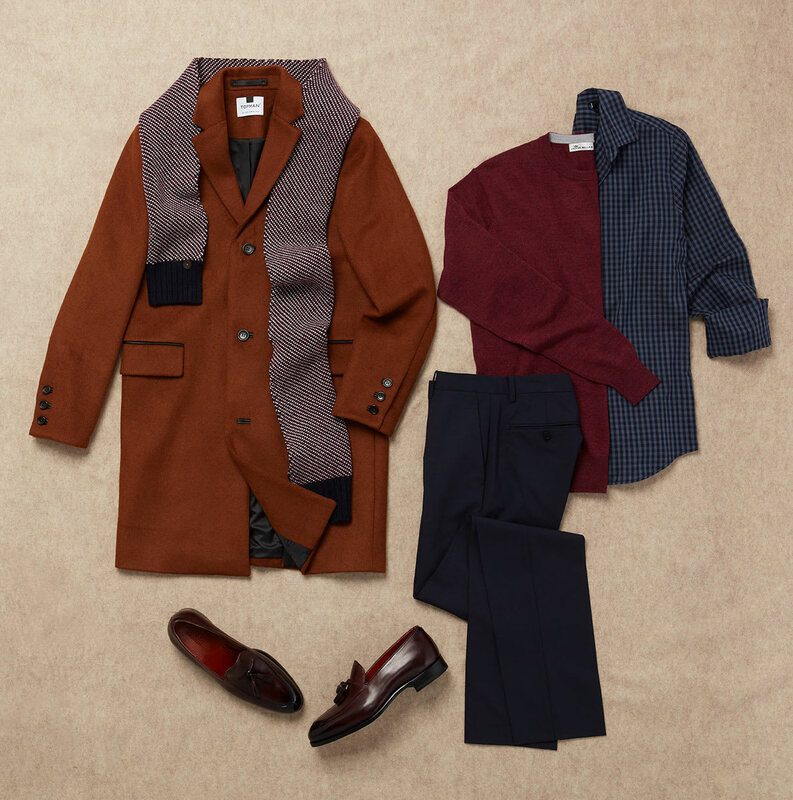 A rich brown overcoat with complementary loafers ties everything together, and a scarf in an interesting pattern is a fun way to break up solids.